The pilgrims gathered on the bow of the ship as instructed by Larien. Their traveling things, now much lighter, had been hoisted above their heads to the awaiting dirigible airship above. Now, they each took turns saying their goodbyes to the Asrai. To R’Zen and Tboi, Amras said, “Courage and wisdom your honor brings. I embrace you for certain of times.” Tboi blushed a pinkish color and R’Zen bowed deeply at the pair. Larian touched Hoss’s face and cradled it there with a rippling kind of sadness in her face, “So acquainted with loss your strength.” She turned to Ingrid and said, “A heart must never win where knowledge can sacrifice.” Ingrid made no sign that she understood, but nodded and hugged the brother and sister. Each of them taking one of Miriam’s hands, they placed a kiss on both and said, “Stories to tell. Stories to tell.” She smiled and shivered, thanking them for their blessing. Terra felt ticklish again as Larien and Amras both gave her a parting hug. “Take your care, world woman,” Larien still used the mysterious title, “must needs to find the cure.” She looked to Ingrid and Miriam for help, but neither had any answers to offer and met her glance only with a shrug or raising of the eyebrows. This is the last quick read of the best (or least despicable) selections from the previous day’s word count, by virtue of my daily writing regimen for the National Novel Writing Month (NaNoWriMo). WARNING: editing has not taken place. NaNo conquered. Next move – additions and revision number one. Terra was excited. It was one thing to read about things, even to watch vids on them, but in a short time she was going to actually see, with her own eyes, the beaches of Kepler-Z. R’Zen, reading her excitement from behind and aching to give his much atrophied legs a good exercise, jogged to her side. Her horse, startled by the appearance of a fully grown matterhorn gentry suddenly appearing at its side, crow hopped and then calmed back to its original trot. “N’Sa, apologetic for startling dumb animal,” he smiled his cantankerous smirk and Terra laughed, not missing his intended irony. “Beach not far,” he trilled, “if Ms. Terra wish to race.” He was stripping his leggings and tying them around his neck. Terra smiled, even giggled a little, then played a game she remembered playing with Ingrid what seemed like so very long ago. Tune in for quick reads of the best (or least despicable) selections from the previous day’s word count, by virtue of my daily writing regimen for the National Novel Writing Month (NaNoWriMo). WARNING: editing has not taken place. Tboi hadn’t spoken or paid much attention to Terra after their disagreement. Now she reflected upon how nice it felt to have been stuck in the same awkward plight with him. She smiled her recognition of this when she caught his eyes. His face, a pleasant mix of relief and contentment, now shifted to one of hurt and disdain. He looked away and she was bruised by his disgust.
. . . So it was that they lived in peace and a wonderful new harmony was formed in the marriage between the two dweller peoples. They became one people, the Lorgose. Traditions mingled and many stories of the two intertwined and became one. They often asked me to make known these stories in original form, but time and again I declined. I judged it a blessing and refused to curse these, my kindred. Still they came, time and again, to ask for a teaching on this matter. On this sol, I am the only remaining constant who can sort them. The Maker empowered me for the purpose I’m given. I watch and I judge, and so my blessing and my curse is this: I remember everything. All form, but also dearly love free reign. And post a sonnet here for you to read. Won’t fit inside a verse that has that count. When forced to beat the drum on every verse. The point and art get tangled for the worse. To say what fewer words could well convey. Or giving fuel to irony at last. And somehow all this ends a melded blend. To focus perfect words at ending joints. Except to rhyme the couplets, Shakespeare style). The Shakespeare variation at each start. The final “G-G” couplet at the end. See – Will abandoned old Petrarchan rule. “C-D-E-C-D-E” was hard to wield. And long before a Puzo story that. To focus all my talent to the task. And really, only seven counted good. With up so floating nothing inked but rhyme. What little is, and tiny left of time. Its “lost-time” acid all my urgent take” . . . Writers have to read. It’s not a chore. Chef’s taste food; athletes watch footage of other athletes; cars get waxed. A project I’m working on requires that I become a connoisseur of Irish history and society. As someone who has always loved the lore and mystical nature of the average stories of Ireland that are tossed around somewhat casually, I am beginning to be in true awe of how for granted the world (and especially the United States) seems to have taken this island of people. I had always had this idea that Celtic culture and religion had begun there. In reality the island served as the perfect geographical location to collect all of the good aspects of historic European culture and (mostly) repel all of the negative aspects. Who can resist the story of how cattle barons got rich and thus became Irish nobility off the backs of traders supplying the Roman army with their tons of leather? Suffice to say that Vikings and Normans, while certainly ancient invaders, also became settlers and, along with the trend, melding with Irish-ness and further shaping the culture. Talk about a melting pot! I’m further enjoying the overlap this book has to the BBC produced, 5 segment special on Irish history hosted by the author. I can read more of the book and then watch the segment covering those bits on YouTube and viola! it stays in there. I’m careful about relying on one source for my information. While this book and the corresponding documentary collection are very comprehensive and informative, I will also seek other sources for my information. 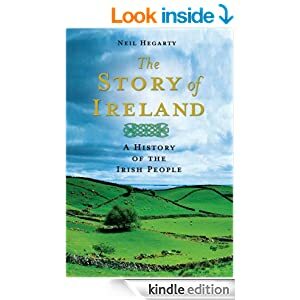 Bottom line here is – if you are Irish American, or even if you are not, there is much to be loved about an island nation that formed from our best qualities as humans and actually SAVED civilization as we know it through it’s academia and careful recording of history while the rest of Europe was burning heretics and killing knowledge. I’m a science fiction fan. Bradbury and Asimov are not foreign to me. So how did I miss this? I came across an estate sale recently where the deceased was obviously more of a sci-fi fan than I. There were complete series of Orson Scott Card, and alas, all the series of Asimov. The Robots were all there. I bought them all. Even the set of Fantastic Voyage books made an appearance. I bought them too. Now, I was aware of the Foundation trilogy, but for whatever reason, had never cracked it open. What I didn’t realize was that he was enticed to write three additional books in the series later in his life. So I got to work trying to figure out what order the books were in to make sure I didn’t miss getting one of the pieces. This is where the trouble started. There were actually one book to each story present but for the price of 50 cents per paperback, I could get the one book that housed the initial trilogy all-in-one for just that. Duh. Except … the cover of this one (unlike the cover graphic I have snagged for this article) listed the trilogy contrary to the order I understood from the other books. It listed them as: Foundation, Second Foundation, and Foundation and Empire. As you can see from the graphic to the right, the actual order is different. Without internet to research my treasure trove, I scratched my head and made my purchase. I couldn’t wait and started reading Foundation as soon as I got in the truck. Thanks my lovely driver! It wasn’t until I got home and researched that I discovered that he wrote the three follow up books out of order and was floored, once again, by his skill and capacity. I gave the idea of reading them in actual chronological order a very brief consideration, but decided to stick to the order they were written. Aside from the sheer enjoyment, I’m reading Foundation because I want to study one of the great masters of world building, to learn how he imagined and threaded together contrived history married with cutting edge science truthes into the magic of science fiction where, indeed, the reader becomes so enmeshed that they could easily live there themselves. In 1928, when Nila was born, the woods had been there, surrounded by more forrest on all three sides. A dirt road drew it’s contour on the east, and a creek ran it’s southern side. When hayfields and corn started dividing the countryside, they’d stopped at the creek, and at the sudden rise in elevation on the north and west sides, and the woods had remained a remnant of what used to be. These and the paved country road where the dirt road had been, clearly defined the boundaries to the property when Nila and Jim eventually purchased it. Nila and Jim married when she was twenty in the summer of 1948. They acquired the woods twenty years later in hopes they might one day build a house there, but the little town of Menden had grown up around the first and only house they would ever live in for their 62 years together. The woods had instead became something of a family member, almost mystical and later, perhaps a bit haunted. Mushrooms grew in some places (if you knew where to look). A nice morel flanked dinner was your reward, and folks in those parts had a hankering for that. In warmer months, the creek bed, it’s silky-soft mud lacing through your toes as it cradled your feet, was host to children and adults alike. The family spent time in the summers trimming and mowing the meadow that served as a huge welcome mat with the creek off to your left, the hill to your right, and a peaceful upsweeping trail on back behind. The meadow had seen many tents, many campfires, and heard many ghost stories. Many a child had woke screaming in their beds, their mothers calling Nila exasperated and angry, after Nila had scared them the night before at a campfire. The creek wasn’t any good for fishing, but that didn’t stop some of the children from tying strings to the end of sticks and dropping pieces of kneaded bread balls into the water. They’d giggle and scream as baby smallies would nibble at the bait, then gulp it down and give their little makeshift rods a tug as they swam away. Nights in the woods were unpredictable. If there wasn’t a group camping, if it had been still and untouched for a time, one of the family teens might park a car just outside the meadow. Still under the canopy of trees and out of sight to passersby, some tried to lay blankets out for their attempts at passion. The more experienced simply cracked the windows and used the back seat, too many creepy crawlies on the damp ground. This went on until Nila’s brother and his wife bought a spread of land next to the woods and built a home there. Nila threatened several grandkids in the late 80’s when reports of their scandalous activities made it to her ears. In the winter, the hill north of the meadow was perfect for sleds. The deer that frequented the woods would keep a low profile when sounds of children whooping and laughing would begin wafting through the trees, magnified by the silence the snow cover promulgated by filtering out other sound. In time, Nila decided to leave the woods wild, and thought of it as a nature preserve. The hill and trails became overgrown, and even the meadow became more and more neglected as the pair grew older and the younger members of the family moved away or had other priorities. A chain link fence, complete with “Private Property” and “No poaching” signs made the boundaries clear at that point. And if family wanted to go for a walk or sit by the creek, they had to retrieve the key to the padlocked gate from the hiding place in Nila and Jim’s pool house. Jim died in 1992, and Nila held on to the woods. When she passed away ten years later it was January. The leafless trees draped over patches of snow and mud, and in its wintery silence, the creek’s trickling of tears and the black and white imagery adjoining it, the woods displayed its profound sorrow and loss. This is semi-biographical and was inspired by the “Landscape and Time” exercise in Brian Kitely’s book The 3 A.M. Epiphany. If I had written in response to this exercise for a class I would have failed, because as usual – I cheated. Alas, I am not writing for a grade. This piece still bugs me for some minor touch-ups in language and direction. I wanted to detail what kinds of trees grow there but, much like a person’s shirt color, I couldn’t recall all of that. Funny. I would appreciate any ideas you have for what works, what doesn’t, etc. Also, feel free to share where you would have written about and why. History is almost always better than fiction. And historic fiction, when done with respect for the actual history, is one of my favorite genres. Actually, it’s very difficult for me to pick a favorite genre, but for your sake, dear reader, I’ll keep it on point here. As I read that, several things struck me. The book was written in 1968, right at the tail end of the Civil Rights Movement, and much of the labeling reflects that. The author refers to people as “Chinaman,” “Mullato,” “Indians,” and “Orientals.” Interestingly, these labels are even used when the subject is revered, or a prominent member of society. And, of course, among other things, the most glaring is the fact that women were treated as property, even talented and well-thought-of women. This story stayed with me for weeks. China Jenny was named, as was the presumably Caucasian Joe. Jenny’s husband was not. This was the only justice to this story for me. Here follows my attempt at historic fiction. Please let me know what you think. “You big haawt – so kine,” and anger dripped from her words as she pulled her skirt back on and turned her back on him. Joe grabbed her arm, his thumb digging into her bicep as he spun her around to face his wrath. But this time Jenny used the force of his motion to bring her other arm around full force and planted her palm squarely on the side of his head. As the contact sent a sharp cracking sound resounding in the one room shack he lived in, his face responded accordingly, twisting sideways with spittle flying in an arch through the air as he released her arm and tried and catch his balance. Time slowed from the shock at this turn of events. And suddenly Jenny turned her back on him again, grabbed her furs, and stormed outside. She somehow wasn’t afraid of his brutality this time. This time she was confused at her anger over this cruel man not loving her like she loved him. She didn’t understand how she could love such a man, but she could see that her violence toward him was a new thing – spawning not from self-defense or latent fury at his past treatment of her. She realized that striking him had come from a place inside her heart, a strange and harmful place that wanted him to possess her fully without forcing her to be taken. She wanted him to wish he’d won her for all time, and not have to share her with another man. And it was this realization that frightened her and made her begin to loathe him less and herself more. Her heart sank when he didn’t demand that her husband bet her all-in against the pot. She lived in a time and place where no one questioned betting the use of her body every other week and she didn’t think to resent that fact. Instead, she resented that this man, with whom she had been with many times before willingly and sometimes unwillingly, didn’t want her fully. In the seconds it took for her to leave, Joe realized that he could have forced her to stay. He could have taken her as he’d done several times before, with her arms and legs flailing and her face turning puffy from his blows before she finally was subdued to his power over her. As he turned to follow her out, her words sank into his skull, and he understood her. It was the first time he had actually heard her, and he felt like he had lost something. If he had ever truly reigned in some small way in this relentless hellhole of a town on the edge of a biting wilderness, the tables had turned. She now ruled him. He didn’t understand and wasn’t the type to analyze it further. But Joe had not actually meant to overpower her those times. He’d wanted someone to love him like he’d never been loved before. He’d been raised by two farmers who cared only for how strong he grew and whether he’d done his chores and the crop was coming along. Their treatment of him had been civil when the weather was good, but it wasn’t only the crops that suffered from the occasional drought. With her words and the force of her hand to drive the point home, his position toward her had changed. He threw some wood into the stove and put some water on for coffee. The emptiness inside him was all too familiar. It wasn’t the all-too-common hunger pains they all suffered in that region. It was something else. The new immigration law and townsfolk’s predisposition made it clear that he could never keep her past the every other week wager he’d won. Still, he found himself longing for her to come back, to touch the redness on his face, and kiss it. Want inturruptingcow in your inbox? Another NaNoWriMo! Who is With Me! ?